A year ago, Newark’s Mojo Main closed its doors for good. The longtime artistic hub, which dated back to 1987 when it originally opened as the East End Cafe, was a magnet for University of Delaware students looking for open mic nights, a venue for their bands or a spot to catch a rare national act in downtown Newark. The vacuum created by Mojo Main’s downfall has led to much of the college town’s musical punch moving north to small, independently run Wilmington clubs like Oddity Bar and 1984. A tour of Newark’s Main Street yields little in the way of live original music these days with a handful exceptions, most notably Home Grown Cafe, which continues to offer local artists a stage four nights a week. But even as Newark continues to limp along without much in the way of opportunity for young performers and bands sprouting out of the fertile UD scene, there is hope. 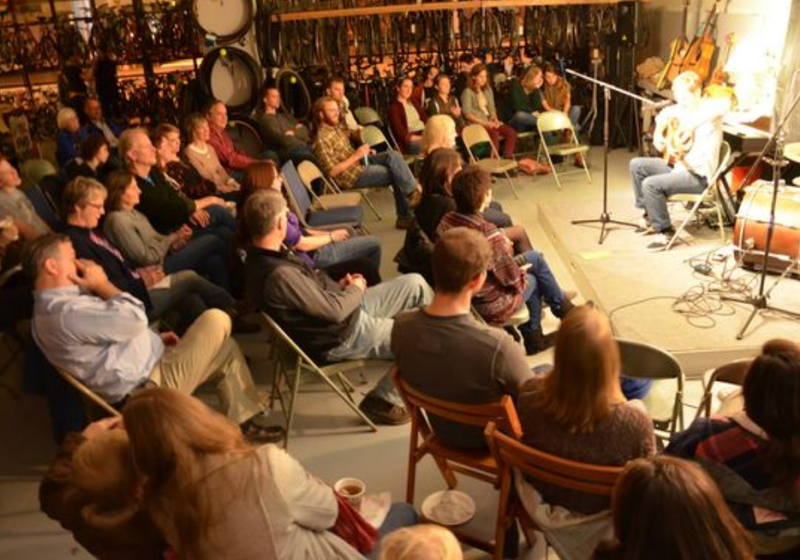 A new venue is buzzing with open mic nights, live comedy shows and plenty of musical performances of all genres. Here’s the twist: it’s not a bar. You can’t pop open a beer in the place or even really talk during the performances. This is more of a listening room. Newark Bike Project, which first opened in 2011 and hopscotched across Newark at temporary locations ever since, has settled into its new permanent home at 136 S. Main Street – the site of the old Eagle Diner. “When you’re not in the business to make a profit – we’re just trying to pay our bills and the cost of our programs – it’s very liberating to use the space for more interesting events for the community good,” says Newark Bike Project co-founder Jamie Magee, 43, of Newark.